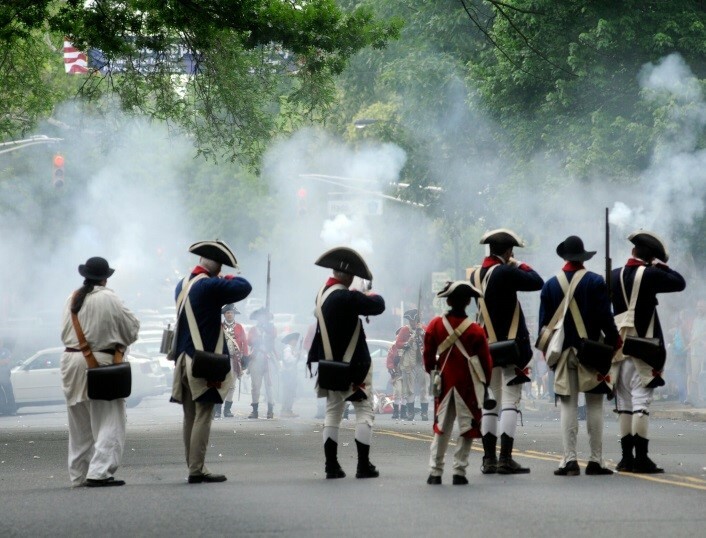 (17/P55) TRENTON – Re-enactors portraying Loyalists to the King of England and Colonialists will bring history alive in downtown Haddonfield, Camden County, on Saturday, June 3 to mark the 239th anniversary of the British encampment. The 5th Annual “Skirmish on Kings Highway,” to be held at the Indian King Tavern, 233 Kings Highway East, celebrates the history of Haddonfield while also commemorating the community’s Revolutionary War heritage. In addition to re-enactment activities, members of the military, police, firefighters and ambulance responders will be honored as part of Service Appreciation Day in the borough. The free, family-friendly event will be held rain or shine, and is sponsored by The Friends of the Indian King Tavern Museum and the Borough of Haddonfield. “This annual event commemorating the important role which Haddonfield played in the American Revolution is a great opportunity for New Jersey residents to learn more about our state’s rich history,” said Assistant Commissioner for Natural and Historic Resources Rich Boornazian. “From the re-enactments to the historically appropriate demonstrations and activities, this event promises fun for all." Activities will begin at 10 a.m. when the Second Pennsylvania Regiment, known as the Continentals and portraying the Colonialists, encamp at Indian King Tavern until encountering the First Battalion of New Jersey Volunteers, who will portray Loyalists. The Loyalists are also known as Red Coats. Loyalists will “pillage, loot and maraud” shops downtown just prior to 1 p.m., when Loyalists will march down Kings Highway and encounter a regiment of Colonial patriots. At that time, the first musket shot will be fired. The skirmish is expected to last about 30 minutes. Although the shots are theatrical, they are loud and visitors are advised to bring ear protection. Kings Highway will be closed for the skirmish, allowing plenty of sidewalk space for viewing and cheering. Several other events and craft-making activities also are planned. A presentation entitled “Marching Toward Monmouth” will explain how soldiers headed north through Haddonfield for that Revolutionary War battle in June 1778. Other events include opportunities for children to muster like soldiers of the day with wooden muskets in front of the historic Indian King Tavern; tours of the tavern; meeting re-enactors in character before and after the skirmish; demonstrations of spinning and basket weaving; and a book signing. Haddonfield – and the Indian King Tavern -- became important to the American Revolution because of the community’s critical location as a crossroads, according to the Historical Society of Haddonfield. From March –September 1777, the New Jersey Assembly met in session at the Indian King Tavern and made two important decisions while there: the governing body declared New Jersey a state rather than a Colony, and it also adopted the Great Seal of the State of New Jersey. Additionally, both American and British troops set up encampments in and around Haddonfield and marched through the community during various campaigns, according to the historical society. And, in 1903, the State bought the Indian King Tavern – New Jersey’s first historic site purchase. To learn more about The Friends Of The Indian King Tavern and Saturday’s event, visit: http://www.indiankingfriends.org or call (856) 429-6792.